If you ever wondered what the Strumbellas get up to after wrapping a gig, it turns out they like to beat the snot out of each other, Street Fighter II-style. 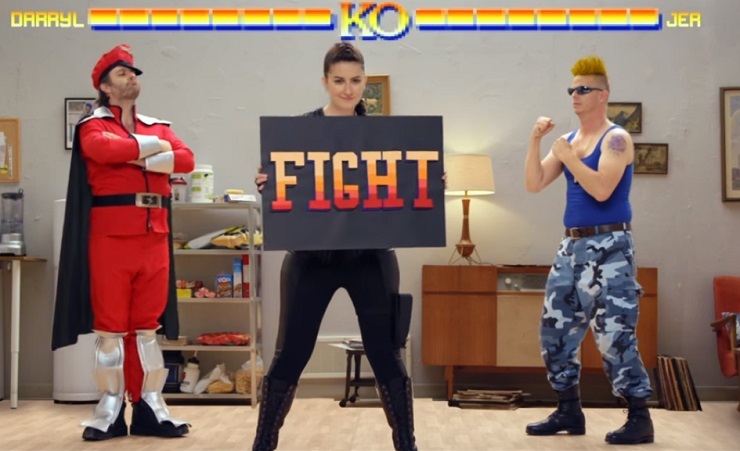 A new, retro-leaning music video for Hope number "We Don't Know" is full of gamer cos-play and a few battle scenes. Directed by Daniel AM Rosenberg, the clip finds the band hopping off stage, trying to unwind in a dressing room. Things get a little heated, and all of a sudden the crew morph into likenesses of classic video game characters like Guile, Ryu, Blanka, M. Bison and more. After duking it out between themselves, a baddie named Lord Doom pops by to beat on the band. You'll find out just how many sonic booms and hadoken's get thrown around in the Capcom-saluting vid down below. As previously reported, Strumbellas are touring Canada with the Zolas this fall. You'll find the tour info over here.